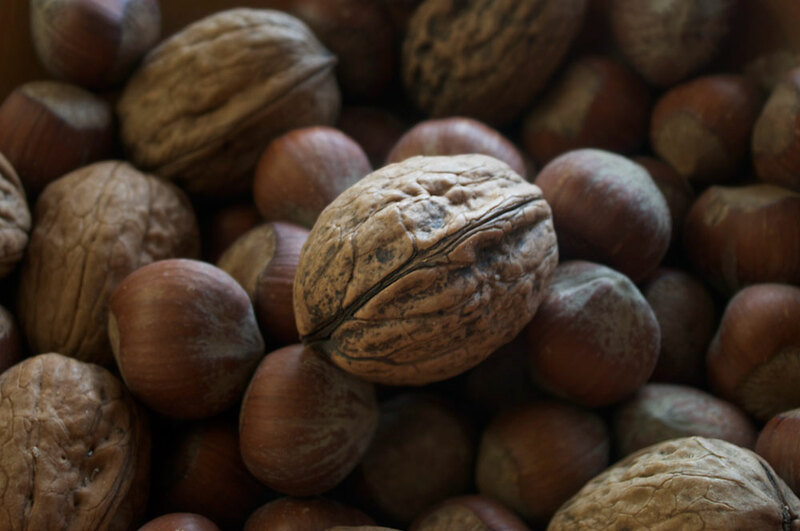 Walnuts in a shell taste 58 times better than ones that have been pre-shelled. Or a gadzillion times better. We bought these walnuts and hazelnuts in Harrison at the end of September, so they are already two months old, but when I cracked one open the other night for dessert, it’s fresh taste was so magnificent I had to immediately text Mr. OP and share the news. It got me thinking about this whole Whole30 plan, the way the focus is on it not being a “diet” but on eating real, unprocessed foods. Not being a meat eater, it’s a little trickier to follow the plan letter by letter, but they do offer vegetarian friendly options. I’m finding nuts are figuring into my meals more than before. The thing is nuts have a lot of calories, and a few handfuls can really add up. 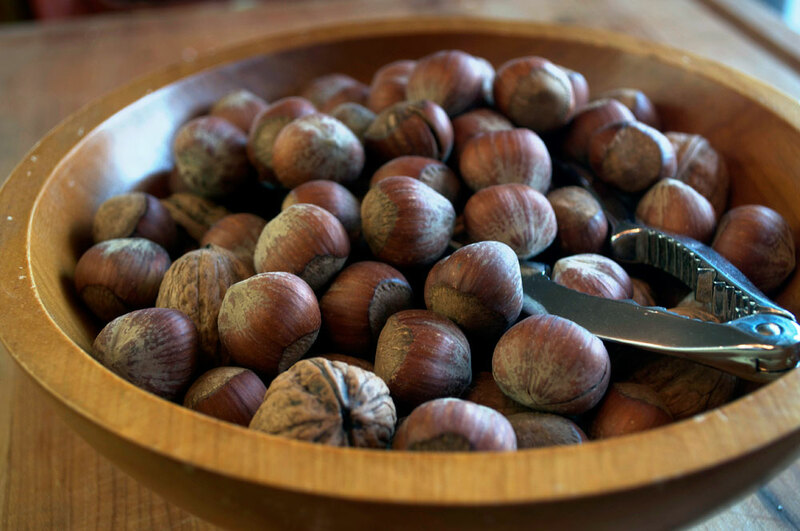 I noticed when I was shelling one walnut, that it takes a considerable amount of time and effort – the cracking, the picking out and the eating. You tend to savour it more. When you buy nuts pre-shelled it’s easier to gobble many handfuls without giving it much thought. The enforced slowness involved in shelling is similar to the slowness created by more meal planning, more fresh vegetable shopping, more soaking (of legumes, “allowed” on the veggie plan), more preparation of food. It starts out being a bit of frustration — “Gadzooks, I have to do all this work?” — then gradually it dawns on you how much of the stuff you consume is processed, even when you think it isn’t. Like shelled walnuts. Hazelnuts are even harder to crack. The energy required to crack them possibly makes the calories within break even. I think “paleolithic man” had to work pretty darn hard to eat her food. Eating nuts this ways created a sense of mindfulness for me, making me pause and reflect upon the effort it took the tree (?) to grow the nuts, the harvesting, and all the steps in between to my table. This Whole30 gig has me reexamining my relationship to snacking — pulverizing Honey-Dijon potato chips in 2 milliseconds will have to be reconsidered in the future (after Christmas of course). 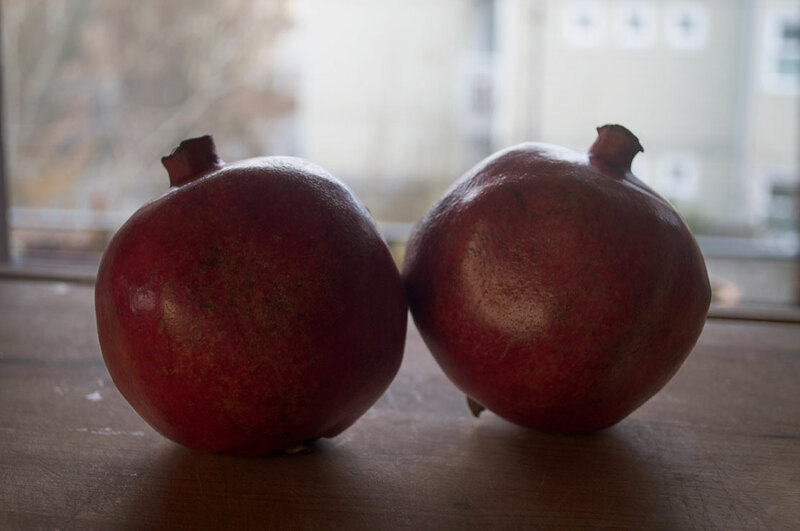 Pomegranates are on the menu for a treat tonight. I’m two days out to the finish line. Part of me never wants to stop eating this way. I definitely feel better and have slimmed down without feeling too much deprivation. I won’t say without an ounce of deprivation, because I definitely felt sulky when passing by the cheese aisle at the grocery store or at the farmer’s market booth. Post finish-line, they suggest re-introducing certain goods gradually, one at a time. I think I’ll start with cheese (surprise! ), but I plan to avoid dairy by and large. The holiday season might make this a tad more challenging. This is the coconut date square from Day 22. Technically, might be a SWPO item, but what the heck. It’s the same ingredients as the (processed!) Larabars with a dash of coconut oil. I will not restart for this indulgence. This entry was posted in Whole 30 and tagged effort, energy expenditure, mindfulness, nuts, paleo vegetarian, real food, time, walnuts, whole foods, Whole30, Whole30 Day 38. Bookmark the permalink.